The surface of your car takes more physical abuse than any other area of the vehicle. Rocks, rain, UV rays, sleet, snow, salt, sand, wind, bugs, you name it and it probably hits your car at one time or another. Not only can your paint job get chipped and scratched, given enough time in direct sunlight it will fade as well. Nothing can make a vehicle look worse or drop the resale value faster than a poor paint job. But will getting a new paint job boost the value enough to pay for itself as a trade-in or private resale? That depends on a couple of factors. Either way, it’s probably a good idea to find out how much it costs to paint a car. There are plenty of places out there that will give you the bargain basement treatment and hook you up with a paint job for under $500. It may even come out looking pretty good. The only problem here is that, with automotive body work, you get what you pay for. Most of these paint jobs are done without proper preparation, with substandard materials, and don’t typically last a long time. That doesn’t mean you can’t patronize the facilities who offer these economy paint jobs; you can’t fault the business for offering an economy option. However, you’ll definitely want to go with the better quality job. How Do I Know Which One Is the “Quality” Job? It’s not all about the price, so don’t just pick the most expensive option on the list and toss over your credit card (probably won’t need to twist too many arms here). However, you do want to pay particular attention to the preparation involved in the paint job. This is where you’ll want to spend the extra money. A good paint job is in the quality of the paint; a great paint job is in the quality of the preparation. How Is My Vehicle Prepared? Make sure the body shop plans to remove all of the original paint and repair any damaged or rusted areas of the vehicle first. This is vital as there are several flaws, such as rust bubbles and minor dents, which can do undetected if the original paint is not sanded off and removed properly. After this, all of the chrome, glass, and non-painted parts are covered. A great deal of detail goes into this step; so the more time spent here, the better the paint job will come out. The next step comes down to quality of materials. Obviously there are some very expensive paints out there. There are some that have metal flakes in them; most of those flakes are made of precious metals like gold. Those precious metals don’t cost any less in paint than they do anywhere else. 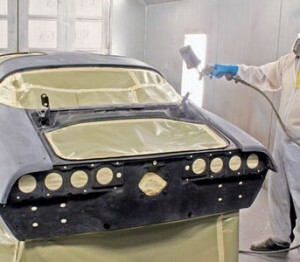 Most paint job customers don’t go with the original factory color when having the entire vehicle repainted. This is where the cost can begin to climb fast. If you’re not going with the factory color, you could end up paying a lot more if you choose to go with an expensive color or paint brand. Make sure you get a quote for the paint price before you get the job done. If you go with a good quality paint, and the proper preparation, you should expect to pay anywhere from $1,800 to $3,000 depending on your paint choice and vehicle size. $1500 buys a good compressor, a good spray gun (actually, I’m tempted to try the HVLP outfit Harbor Freight has for ~$100), lotsa paint, and a couple of body panels from the junk yard to practice on before tackling my own.